Dark spots, hyperpigmentation, and acne scars are three of the peskiest skin issues we experience. The right skincare products are the first defense, like a good exfoliant, brightening cream, and vitamin C serum. (May we recommend Memebox's Nooni Repair Turnover Peel Pads $25, Korres Wild Rose 24-Hour Brightening and Moisturizing Cream $39, and CosRx Triple C Lightening Liquid $27, respectively.) However, even with all of the best products in the world, it's possible a particularly stubborn spot will stick around. That's when some people look to other remedies, like hydroquinone. According to cosmetic and plastic surgeon David Shafer, MD, FACS, "Hydroquinone is a chemical compound discovered in the early 1800s, which was used in everything from skincare to photo developing. The chemical interacts with the melanin-producing cells in the skin, decreasing the production of pigment." While it can be effective at lightening dark spots on the skin, there has been some debate as to whether or not it's safe. Keep reading to see what the expert has to say. "Hydroquinone is a topical skin treatment for melasma, freckles, age and sun spots, and even acne scars," Shafer says. "Used in combination with other acne products such as Retin-A, hydroquinone can help dramatically improve skin complexion." That doesn't mean it has permanent effects, though. In fact, Shafer says it's quite the opposite. "The effect is temporary, as discontinued use and exposure to the sun can lead to renewed production of pigment and the return of dark spots." The effect also isn't immediate. It may take a matter of weeks before results are discernible to the naked eye. "Patients need to understand that the treatment is working at the cellular level to reduce the production of pigment," Shafer says. "So the effects take several weeks to realize. As the old skin sheds and new skin is produced, the amount of pigment will be less, leading to a more even skin tone." Here's where things get even murkier. Even though it's been shown to effectively lighten dark spots, it's not without risks. The lesser risk is the potential for so-called "halo spots" around the treated areas. "The hydroquinone treats dark spots, but any product in contact with surrounding skin will also lighten those areas as well. So the intended spot may be lightened, but the surrounding skin will also lighten compared to normal skin, and the area will appear like a light depigmented halo around the spot being treated." There is a way to avoid this, however. Shafer recommends lightly applying a hydroquinone solution to a region or area, versus a single dark spot or acne scar. But some might say that defeats the purpose of using it as a spot treatment. The biggest, most substantial risk, however, is that it hasn't been ruled out as carcinogenic by the FDA. "It was found to increase the incidence of neoplasms in rats," Shafer says. "However, the risk to humans is unknown." Because of the rather dubious research, Shafer recommends looking elsewhere for dark-spot relief. "There are other skin-lightening and skin-brightening products available with fewer side effects," he says. His favorites are two separate skin tone–correcting products: SkinMedica Lytera 2.0 ($154) and Sénte Dermal Repair ($150). "Both products have components which also interfere with pigment production but without the skin irritation or sensitivity. 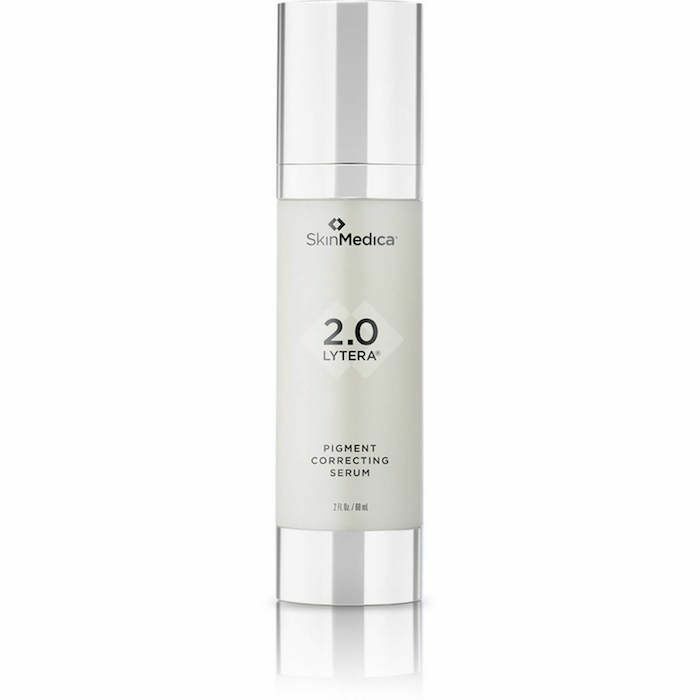 Clinical studies show that Lytera 2.0 is just as effective as hydroquinone. Both Lytera and Dermal Repair from Sénte are available at doctors' offices as part of a continuing skincare regimen." Next, see the $65 all-natural face oil Kate Middleton uses for her glowing complexion.